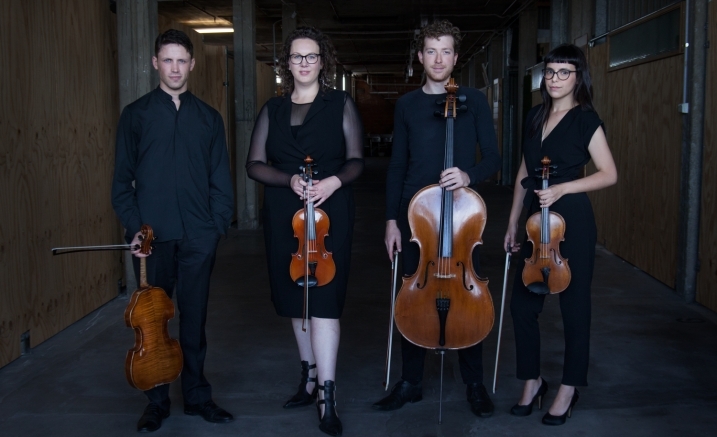 Formed at the Australian National Academy of Music in 2014, Penny Quartet is rapidly gaining a reputation as a fresh, interpretative voice to chamber music giving high profile recitals, festival showcases and master classes across the country. Blossom explores the intimacies of chamber music across three very personal works. Beginning with Elliott Carter’s poignant tribute to a departed friend in Fragments I & II, the program also showcases a world premiere performance Vignettes written by the Penny Quartet’s dear friend Joseph O’Connor. Concluding with Peteris Vasks’ achingly melancholic ode to nature, Sommersweisen. Vignettes is a suite of mini-concertos featuring each member of Penny Quartet. It is tempting to imagine soloist in the romantic guise – heroic figures of unassailed musical prominence – but the soloists’ roles in Vignettes are neither stable nor unchallenged. We might liken them to Australia’s recent Prime Ministers, searching for decisive leadership as they fend off musical opposition from all quarters. Each miniature responds to an image or situation. The suite drifts into consciousness with Jack Ward’s cello in Waking Dream, which dwells on the wistful yearning that we experience when a delicious waking fantasy is cut short. In Choir Loft Maverick, a pied butcherbird is set loose in a church. A dissonant polyphony (a quasi-chorale) is interrupted by its intricate songs re-imagined for Amy Brookman’s violin. Madeleine Jevons then speaks through her violin to find a moment of clarity as she resists the urge to conform to the Idle Talk around her, authentic but alone. In the final miniature Filigree, Anthony Chataway’s viola revels in delicate textures that are richly patterned like finely wrought scrollwork. Joe composed Vignettes during the four-year period 2014-2018 as a showcase of the exceptional musicality of Penny Quartet’s personnel.